From day one, we see to it that you are becoming the scholar—the person—we know you can become. How? 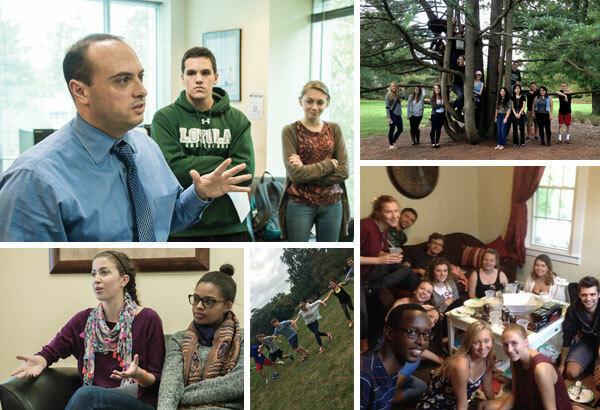 Through a unique opportunity to engage in an interdisciplinary living and learning experience called Messina. Students live and learn with a small cluster of peers, enabling them to build connections from the moment they arrive on campus and to stay intellectually and personally engaged in and out of the classroom. Messina will help you acclimate to life on campus and set a clear path for success in college and your career. It’s one of the reasons why graduates leave Loyola so readily prepared for their future lives. Each Messina course pairing is keyed toward an interdisciplinary theme that will allow students to make connections across the two courses and beyond, through course enrichment sessions. We invite you to explore the different options. Living with your fellow classmates allows you to make meaningful connections starting the day you arrive at Loyola, fostering social and intellectual engagement both inside and outside the classroom and helping you with the transition to college life.